Air Fryer Frozen Sweet Potato Fries. 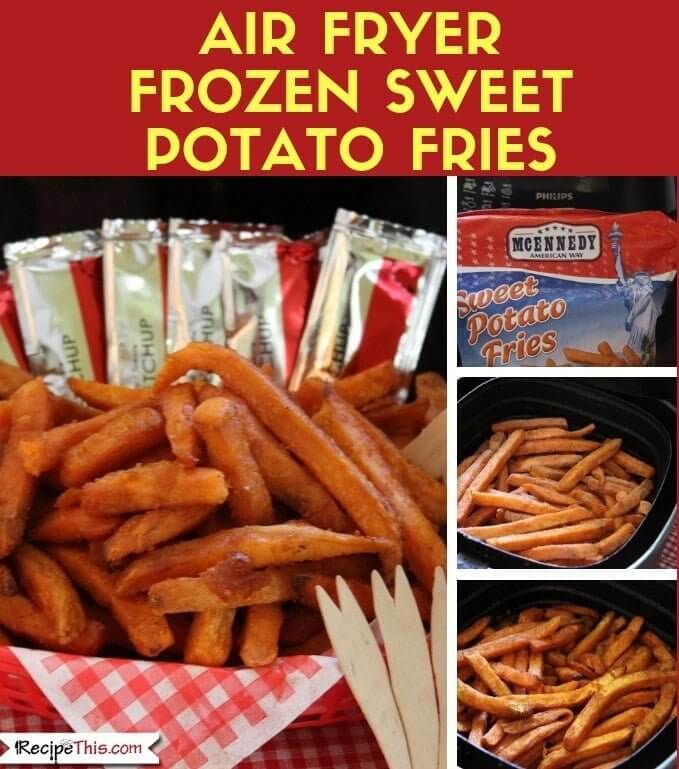 Have you bought some frozen sweet potato fries and don’t know how long to cook them for in the air fryer? You have come to the right place! Here at Recipe This we will show you how to cook perfect air fryer frozen sweet potato fries until they are perfectly crispy and are not soggy. For February 2019 here on Recipe This we are celebrating frozen foods in the air fryer over the weekends. Saturday and Sunday will be dedicated to all our favourite frozen foods and showing you how easy they are to cook in the air fryer. Quite often with frozen food we either cook them in the oven and they don’t have that amazing crispy texture, or we cook them in the deep fat fryer and add way too many calories to our dinner plate. Plus with the air fryer it takes half the time to cook frozen food compared to in the oven. The air fryer is fantastic, because it gives you the oven option, but crisped up like the deep fat fryer. If you don’t have an air fryer yet, then this is the one we currently own. I HATE making my own air fryer sweet potato fries. Its not like white potatoes because you always end up with stupid shaped potatoes that never go well as sweet potato fries. Or out of season you will be lucky if you can make one little cube of sweet potato with them. It drives me crazy and I just wish they had a longer season and you weren’t left with these tiny little things that wouldn’t even produce enough sweet potato to feed a baby. In the end my sweet potatoes that I buy either end up as little cubes or they end up being turned into odd shaped sweet jacket potatoes. But frozen sweet potato fries in the air fryer and you’re talking my language. After experimenting with different frozen foods brands, we have found that there is not much difference from one brand to another with cooking times. Some might use a different type of oil or seasoning, but overall, they are all the same shape and size. The brand we used for our air fryer frozen sweet potato fries was Mcennedy and this was purchased at Lidl as part of an Americana theme they were having. It was produced in Belgium and it is a 750g bag of frozen sweet potato fries with 5% of its contents being sunflower oil. Instead you break open a bag of frozen sweet potato fries and throw them into the air fryer. There is no prep whatsoever and depending on the brand, they will be flavoured to perfection once cooked. But don’t think that you must stop there as there is plenty of other air fryer frozen food, that also tastes spectacular thanks to how crispy the air fryer cooks your food. Air Fryer Frozen Sweet Potato Fries. Have you bought some frozen sweet potato fries and don’t know how long to cook them for in the air fryer? You have come to the right place! Break open your frozen sweet potato fries bag, and place the contents into your air fryer basket. Cook for 12 minutes on 180c/360f. Shake half way through at 6 minutes so that the sweet potato fries do not become stuck to one another and that they evenly cook. Serve warm with your favourite sauce. Sweet potato fries do not like to be overcrowded, therefore don’t cook more than 750g at once. If you have more, then cook them as a separate batch. If you’re using the air fryer to cook multiple things and must do them in batches always do the fries last. This is because meat stays warm nicely in an oven, but fries do not.